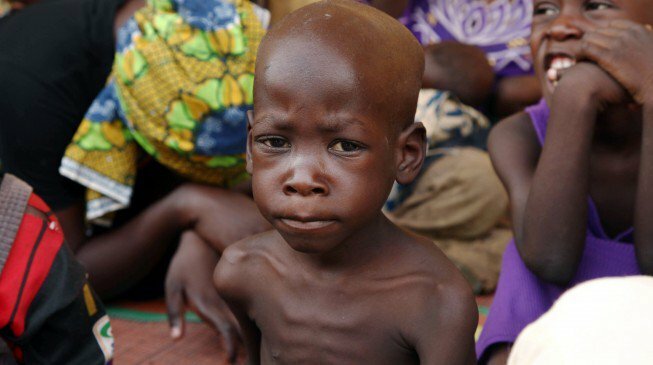 An estimated 2.3 million Nigerian children under five (U5) years die every day. This not only makes the country one of the highest contributors to the under-five mortality in the world, but also results in massive cost for the nation. More than a half of these deaths are related to malnutrition causes. Those who survive often become stunted. Six-year-old Chilotaram Mba appeared skinny and sickly. Her height is a sharp contrast to her age as anyone could easily mistake her for a child half her age. Her four-year-old sister, Princess Mba, is also in the same condition. Their aunt, Agatha Mba, who translates on behalf of their mother (because she does not speak English), told Independent that the doctors had diagnosed her two nieces as being malnourished and in need of treatment. Chilotaram and Princess represent over 11 million Nigerian children who are under five (U5) years afflicted with stunted growth, making Nigeria to rank second only to India in the global list. The country also accounts for one-tenth of the global burden of severe acute under-five malnutrition (SAM). According to experts, there are multiple dimensions of child malnutrition that can coexist in individuals, households and populations which could manifest in form of stunting, wasting, micronutrient deficiencies and overweight/obesity. The United Nations Children Fund (UNICEF) reports another sad statistics of 37 per cent of the U5 children who are stunted, while 29 per cent are underweight, just as 18 per cent get wasted. Stunting is the major indicator used to measure childhood malnutrition. Stunting compares the height with the age of a child -too short for age due to inadequate intake of the required nutrients over a period of time. Research has shown that poor physical growth and brain development resulting from poor nutrition in children make them not to thrive and live to their full potential. About 30 per cent of Nigerian children are underweight (don’t weigh enough for their age), more than double the proportion of underweight Ghanaian children. The 2015 World Health Organisation (WHO), National Nutrition and Health Survey (NNHS) Standardized Monitoring and Assessment of Relief and Transition (SMART) indices showed a gory picture of malnourished Nigerian child. It stated that 33 per cent of Nigerian children were stunted, while seven per cent suffered wasting, 19 per cent were underweight, even as 25 per cent benefitted from exclusive breastfeeding (EBF). Lamenting the situation, Dr Chris Osa Isokpunwu, Head of Nutrition, Federal Ministry of Health (FMOH) in his presentation at a two-day media dialogue on “Leveraging Resources for Child Malnutrition in Nigeria,” noted that the two immediate causes of malnutrition are inadequate dietary intake and diseases. During the meeting which was organised by the United Nations Children Fund(UNICEF) in collaboration with the Child Right Bureau of the Federal Ministry of Information and Culture, Isokpunwu further observed that malnutrition leads to integrational cycle of growth failure as nutrition affects all stages of the lifecycle. It also causes child growth failure, low birth weight baby and low weight and height in adolescents, he also said. According to him, adequate nutrition during the first 1,000 days (from the start of a woman’s pregnancy until her child’s second birthday) can avert malnutrition ensuring that children have the best possible opportunity to grow, learn, and rise out of poverty. Effects of malnutrition are often irreversible after this period, he stressed. Malnutrition occurs when a person does not receive adequate nutrients from diet. This causes damage to the vital organs and functions of the body, the Head of Nutrition said. Certain illnesses and infections, such as tuberculosis, measles, and diarrhoea are directly linked to acute malnutrition, he added. Quoting the 2014 WHO, NNHS and SMART indices, he also said that 21.6 per cent of Nigerian infants between six and 11 months suffered stunting, 13.9 per cent of them wasting, while 22.7 per cent were underweight. Similarly, Isokpunwu said, in 2015 WHO, NNHS and SMART indices, 35.4 per cent of infants between 12 and 23 months were stunted. Those who suffered wasting were 12.9 per cent, while 25.7 per cent were under-weight according to nutritional indices by age. The SDGs 2 further aims at ending all forms of malnutrition by 2030, including achieving by 2025, the internationally agreed targets on stunting and wasting in children under five years of age. In line with the SDGs, the overall goal of National Strategic Plan of Action for Nutrition 2014 to 2019 is to improve the nutritional status throughout the lifecycle of Nigerians, with a particular focus on vulnerable groups, especially children under five years of age. Also, the National Strategic Plan of Action for Nutrition from 2014 to 2019 specifically aims at reducing the number of under-five children who are stunted by 20 per cent by 2019.